Death has released Thanos from her cold embrace, and he plans to repay her by murdering half the universe! 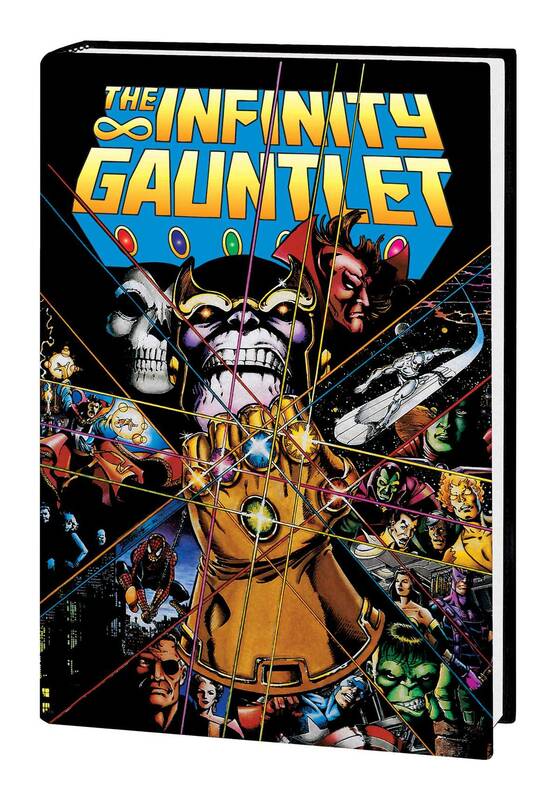 But even as the Mad Titan gathers the six Infinity Gems from across the galaxy, assembling them into the Infinity Gauntlet and gaining truly godlike powers, a host of heroes gather to oppose him - including the Silver Surfer, Adam Warlock, Gamora, Drax the Destroyer, Dr. Strange and the Hulk! Even with Dr. Doom, Galactus and the universe's cosmic powers aiding them, can Marvel's mightiest possibly prevail against Thanos the all-powerful? At long last, the fan-favorite cosmic event is collected in its entirety! Collecting SILVER SURFER (1987) #34-38, #40 and #44-60; THANOS QUEST #1-2; INFINITY GAUNTLET #1-6; CLOAK AND DAGGER (1988) #18; SPIDER-MAN (1990) #17; INCREDIBLE HULK (1968) #383-385; DOCTOR STRANGE, SORCERER SUPREME #31-36; QUASAR #26-27 and SLEEPWALKER #7.